A few hours ago, Raya asked me if I had received my gift yet. Then I hadn't, but now I have. That shot glass, pffthaha. But man, it makes me cross that mine somehow sank across the Atlantic. I have the suspicion US customs might have chucked it because it contained a, uh, item they frown upon. That fact a used pipe got through but my bonus surprise didn't pisses me off. Speaking of which, I finally got a reply back from Royal Mail about where my package went. It was essentially "we dunno, lol", and they refunded most of the item costs/postage (I couldn't claim back for the chocolates I included). So I'm essentially back at square one. Which means I'll make up a new package and ship it out, minus the dodgy item this time. You'll get it eventually, recipient! Raya wrote: That shot glass, pffthaha. But man, it makes me cross that mine somehow sank across the Atlantic. I have the suspicion US customs might have chucked it because it contained a, uh, item they frown upon. That fact a used pipe got through but my bonus surprise didn't pisses me off. Kinder Surprise smuggling is a serious offence!!! What can I say, I'm just that good! My Secret Santa gift arrived about a week or so ago, and I am finally now posting pictures finally!!!!!!! 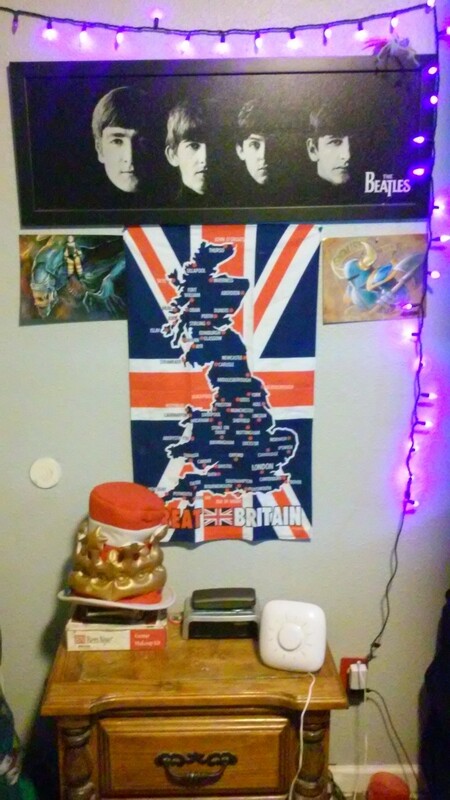 I received a tea towel of Great Britain, which I immediatelly hung in my bedroom above my bedside table. I got a ton of candy, which I ashamedly already ate. I go through each of them in an unboxing video I made for Raya. There was one candy in particular that absolutely blew me away, Fruit Pastilles were the real underdog, thought I would enjoy all the chocolates much more and it ended up being the best. Close second go to Double Decker, with Crunchies as a runner up. European Chocolate is better than American, for sure. 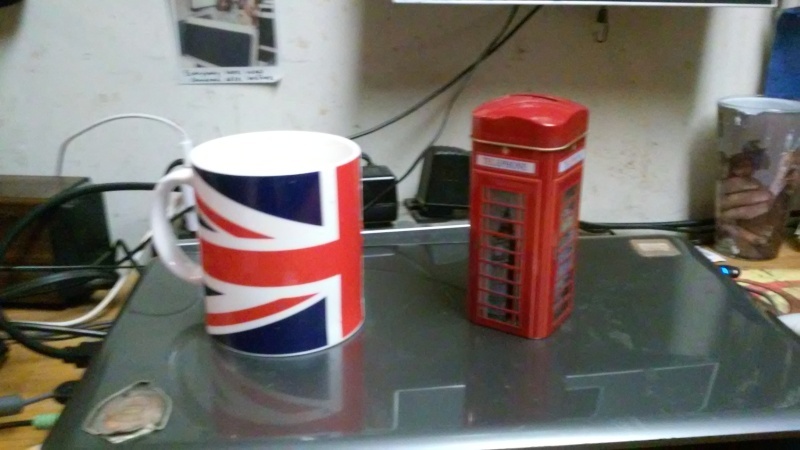 And lastly, I got both a Union Jack mug and a wonderful souvenir hone booth tea case with legit English Tea, which I am about to try for the first time after posting this. Thank you Raya!!! I loved it all! I'd call this years Secret Santa an overwhelming success on our end! Well, you wanted souvenir crap, so I obliged I'm so, so glad you like it. I'm still grinning from ear to ear from the video. Sorry about all the drama with receiving it, I hope the contents made up for it. Since MAD is happy with getting his gift from Vie in the summer, I think we can officially conclude the forum's first secret santa! Thank you ever so much to everyone who took part; it's been brilliant seeing what you all received, and I hope you've enjoyed it as much as I have. There were some teething problems, granted, but it's the first time we've ever tried anything like this, so some were to be expected. I've loved taking part, so hopefully we can do this again next Christmas Thanks again! Raya wrote: I've loved taking part, so hopefully we can do this again next Christmas Thanks again! It's that time of year again! Who fancies doing Secret Santa again? We had a few teething problems last year, but things worked out and I think it turned out as a big success. This time though we might actually get our presents in time for Christmas So, wants to take part? I'd like to! I missed out last time. Great to see interest I'll keep signups open until mid-November to give people time to sign up, but also so this year people can get their gifts before Christmas! Give people who might have missed the thread a poke to sign up, the more the merrier! - Everyone needs to PM me a way for them to receive their gifts. This is either a postal address (if you want a physical item), a Steam account name, an email address or any combination. Please double check that it's all correct! - After sign ups have closed, I will use a RNG to randomise your secret santa/recipient. If you get the same person as last year, I'll reroll to ensure it's someone different. - I'll PM each person with the contact details of their recipient. - Buy your gift and send it to your recipient! There's no limit, but try to aim for around $20 (this is to ensure nobody feels ripped off if they spend a lot but get something small in return). - Let me know when your gift has been sent off so I can keep track of where everyone is. - When you get your gift, post pictures so we can all see! Can everyone send me their contact details either through PM or on Skype ASAP; as soon as I receive them all I can send them to your santa. Some of you have done this already, so thank you! Secret santas have been drawn, you should all have a PM with all the details in now. Any problems or questions contact me. Also please let me know when you send off your gift, so I can keep track of where everything is. be sure to post when you get yours as well! This is going to be...something. What's the status for everyone else? 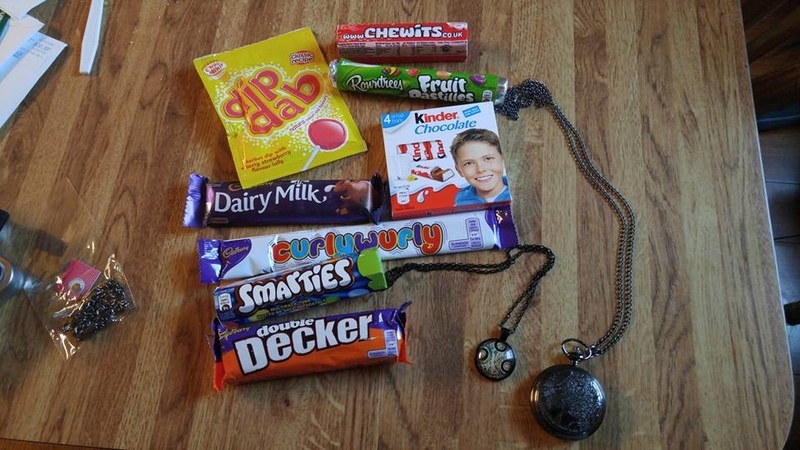 I have received and sent my secret santa stuff. 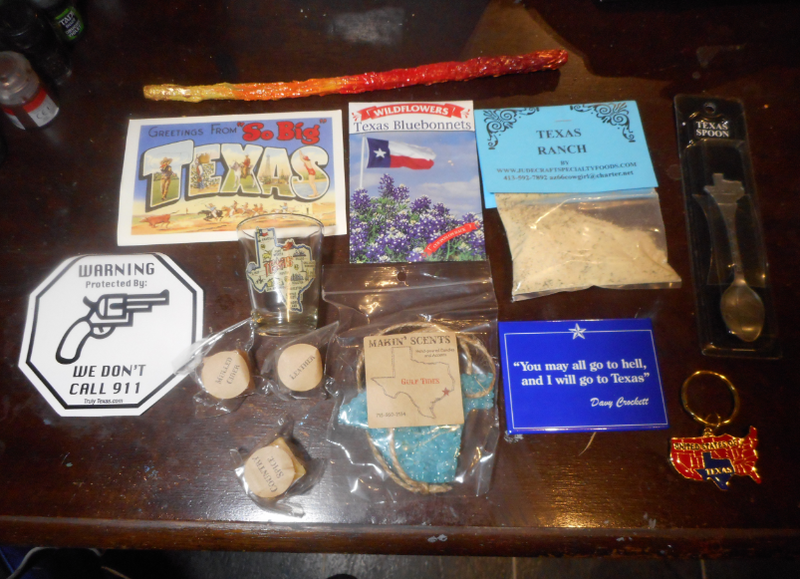 There's a retro postcard, seeds for what I assume is the Texan national flower, powered Texas ranch dressing (I honestly thought they were drugs at first), a spoon, a magnet, a keyring, an air freshener, a sticker I don't think I'd be allowed to put on my door, a Harry Potter wand (because y'know British) and a shot glass containing...three square somethings. I assume you dissolve them in alcohol? 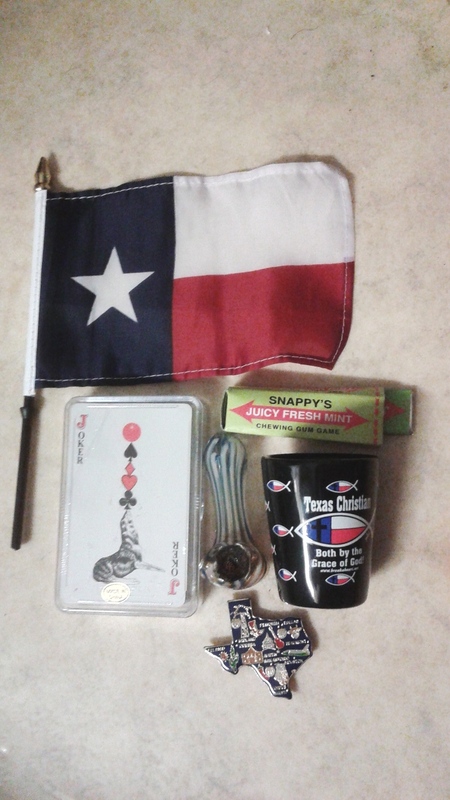 I absolutely love my presents, thank you ever so much Snake! Anyway! I'm thrilled with the Doctor Who Fob Watch! It's something I always looked at getting, but never really picked up for one reason or another. And the candy (What I've had so far) is delicious. Kinda makes me upset that supermarkets here don't carry them, but then I remind myself America still has Hamburgers down-pat and that calms me. Thanks to Raya for the great gift(s)!